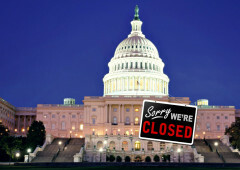 The October 1, 2013 U.S. government shutdown has affected many federal agencies, some of which professional background screeners rely on to conduct searches. With the recent shutdown, several federal websites have been shuttered, and access to certain information suspended. Why shut down a website when it could still be operable for consumers or anyone else to obtain information? It’s not like a website needs a federal employee to operate it each day. For example, the Federal Trade Commission (FTC) website is completely shut down. Since employment background checks are considered “consumer reports,” the FTC is the agency that enforces the Fair Credit Reporting Act that regulates all consumer reports. As a consumer reporting agency, Hire Image must comply with the FCRA. In my opinion, the site could remain open for quick reference or information. E-Verify® – The system provided by U.S. Citizenship and Immigration Services (USCIS) falls under the Department of Homeland Security, and is used by employers to determine work eligibility of new employees. This service is not available during the shutdown. Click here for more info. Consumer Financial Protection Bureau (CFPB) – The website is active, providing consumers with information they need to make the best financial decisions, supervising financial institutions and enforcing federal consumer financial laws. It is unclear if complaints can be filed at this time. Bureau of Industry and Security – A division of the U.S. Department of Commerce which provides a listing of denied entities and denied persons in which many businesses are required to check before doing business will not be updated during the shutdown. Other Federal websites such as those reporting Specially Designated Nationals List, AECA Debarred List and Nonproliferation Sanctions are also not being updated. The government shutdown affects many aspects of our business and professional lives and holds up access to many critical services. Let’s hope our federal government can get back to work soon!